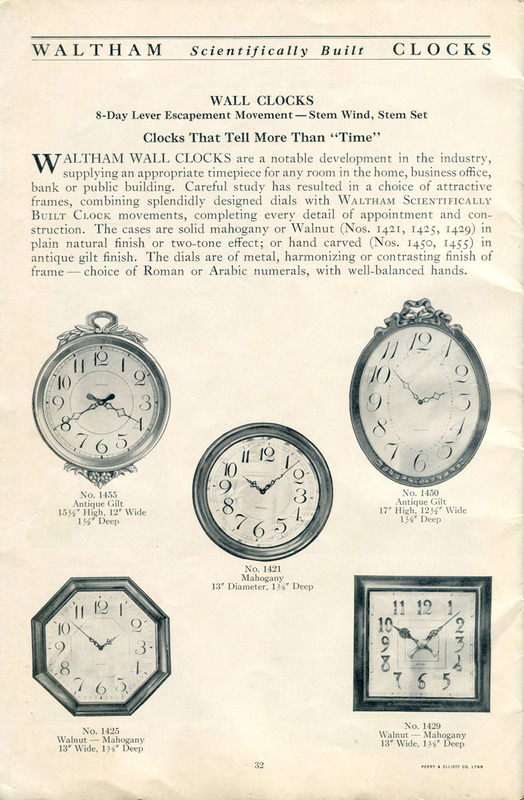 Page.32 WALL CLOCKS - Clocks That Tell More Than "Time"
Clocks That Tell More Than "Time"
WALTHAM WALL CLOCKS are a notable development in the industry, supplying an appropriate timepiece for any room un the home, business office, bank or public building. Careful study has resulted in a choice of attractive frames, combining splendidly designed dials with WALTHAM SCIENTIFICALLY BUILT CLOCK movement, completing every detail of appointment and construction. The cases are solid mahogany or Walnut(Nos. 1421,1425,1429) in plain natural finish or two-tone effect; or hand carved(Nos. 1450,1455) in antique gilt finish. The dials are of metal, harmonizing or contrasting finish of frame --- choice of Roman or Arabic numerals, with well0balanced hands.